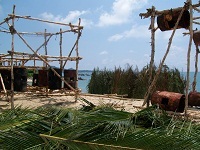 Tukik Babel was created by Sian Soegito in the year 2008, out of his own interest for sea turtles. 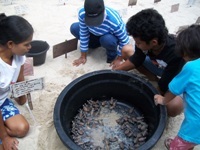 In the first 4 years we were using a hatchery within the Batavia Banka Beach resort, where we raised the hatched turtles in artificially made water tanks. We found out that if we keep the turtles longer than 2 months, they become lazy and attached to being fed, so they would come back to the beach even if released from a boat. So we did not keep them for more than 2 months. 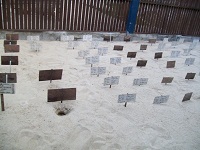 In 2010 we were buying the sea turtle eggs from the markets where they are illegally sold for consumption, but it turned out that the eggs being already several days on the market are not able to inkubate anymore. Nearly all were spoiled. So in the following years we turned back to only ollecting the eggs directly on the beaches. 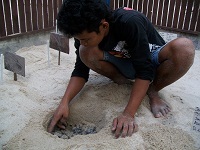 Knowing that often young sea turtles develop problems later on when head started by feeding them, in October 2012 we decided to change the location of the hatchery and the feeding area. We moved about 500m north into a marina. Here we created a big area within the marina, where they lived up to 2 weeks after hatching until being released. Within the marina they could already search themselves for food like in the open sea. 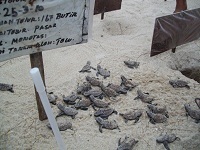 Then in 2013 we decided not to keep the hatchlings for feeding anymore, we released them as soon as practically possible with a boat a few kilometres far out at sea, so they did not have to swim through the area where there is offshore tin mining going on. 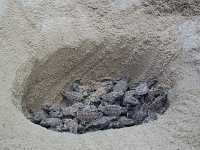 Only 20 hatchlings we kept for the visitors to see until the next ones were born, usually never more than a week. 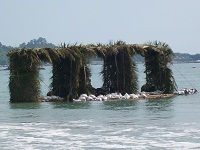 In the year 2008 we have also created big structures for sea grass to grow on them, and have sunk them further out at sea, to create new feeding grounds for sea turtles. Within the marina we keep some adult Green Turtles and Hawksbill Turtles for our visitors to see how beautiful full grown sea turtles are. Their area is about 30m x 20m big. Beside some TV stations that have reported about Tukik Babel, we have regularly visitors who come to see our work, so far most of them were from our island Bangka, but some even from other countries. We are hoping to get people worldwide interested in sea turtle protection and our sea turtle work. To download a 16 page book layout about the history of Tukik Babel, klick here.